Your demolition/excavation project isn’t finished until the site is clean and ready for your next step. Let the professionals at Rock Hammer Demolition remove your concrete, asphalt, and masonry debris. A professionally planned removal is easier than you think. One call is all it takes to start the process. Nobody understands Southern California’s complex and rigorous environmental protection rules like a local service provider. With over 35 years of experience with federal, state and municipal regulations, Rock Hammer Demolition is the one-stop source for a clean, compliant site. We serve all of Southern California, Orange County, San Bernardino County, Riverside County and Los Angeles County with a clean, well-maintained fleet of Super Ten Trucks, End Dump Trucks, and Roll Offs. We’ve got the right piece of equipment for your job. 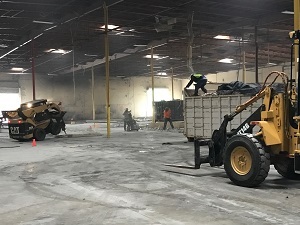 Whether it’s reinforced concrete, asphalt, brick or stone, soil, gravel or rubble, Rock Hammer Demolition is committed to making your most pressing construction and demolition disposal problems disappear. We won’t leave you stranded. That’s a promise. It’s a guarantee.